"I've been learning to play guitar on and off for twenty years and was perfectly able to reproduce a competent tune. However, I'd never been good enough or confident enough to play by ear, improvise, transpose, play lead or generally do my own thing. It turns out that what I needed was someone to take me back to basics, unlearn my bad habits and teach me the basic building blocks of music theory. That person was Kevin Minney and within 2 months he had me playing at a higher level of understanding than I've ever done in twenty years. Where before I was just memorising and regurgitating now I'm actually playing and, what's more, I'm getting better every day. I cannot recommend Kevin enough, he's a total maestro"
"Kevin has boosted my sons confidence and has taken him from a beginner to Grade 1 in just a few months. I have felt that Kevin gives a good mix of inspiring my son to play whilst guiding through the necessary steps to pass a Grade"
"Kevin was great, showed me the difference between playing the notes and playing music. Very patient and methodical approach to make it more fun to learn. Best teacher I’ve ever had"
“Kevin taught acoustic, classical, electric, and bass guitar to pupils at Akeley Wood School. I know him to be a first-rate teacher, whom I have always found to be a highly professional member of staff. A born enthusiast, his infectious love of music makes him popular with both colleagues and pupils alike. Music is extremely strong at Akeley Wood School. Kevin always worked hard to support his pupils and prepare them for the range of concerts and music events that take place throughout the School year. He also repeatedly wowed public audiences with his own virtuosity at the annual School rock concert, ‘Akeley Woodstock’. Frankly, I was extremely disappointed to see Kevin leave Akeley Wood in order to facilitate his plans to relocate to another part of the country. That said, I completely understand and support his decision to do so, and I have no hesitation whatsoever in recommending him to you”. Dr. Jerry Grundy MA (Oxon) PHD (mcgill) – Headmaster at Akeley wood senior school. 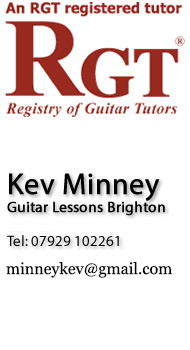 “I sought for a Guitar tutor, in brighton, after trying a couple of other tutors Kevin was the only who showed me what I needed, he Encouraged, inspired and motivated to love my guitar"